I remember the first meal — a red lentil turmeric soup — that a friend brought over after my breast cancer diagnosis in 2016. She also brought over a jar of turmeric and briefly mentioned the anti-inflammatory properties of the spice. 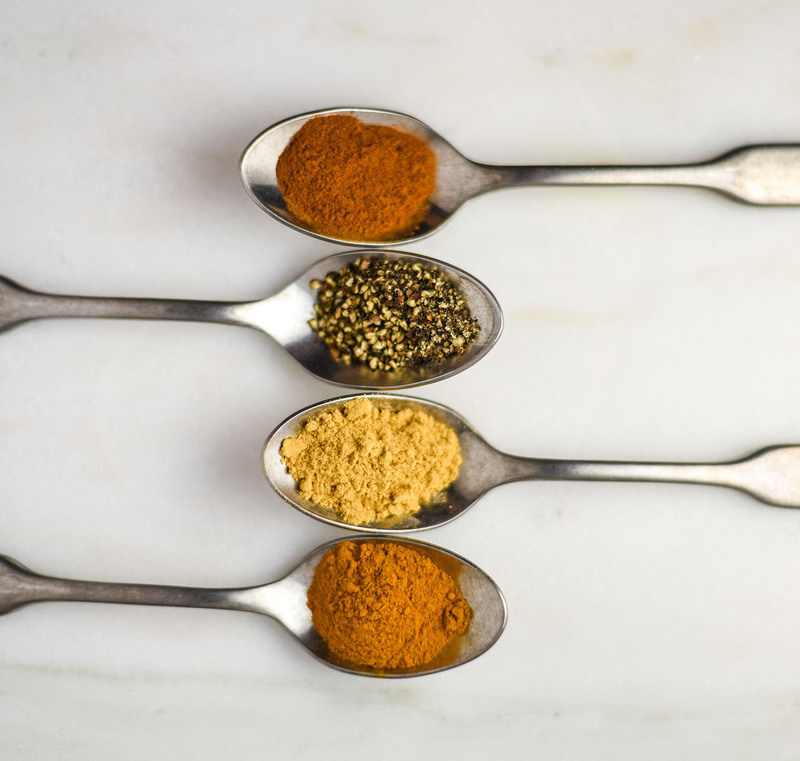 I was familiar with turmeric from a few months of traveling in India and loved the warmth and color that it added to meals, but I hadn’t considered singling it out for its health benefits. Although I was still in a state of shock from the cancer diagnosis, her words triggered a desire to learn more about how food can heal the body. My love for turmeric and more generally, plant-based eating, was born in that moment. 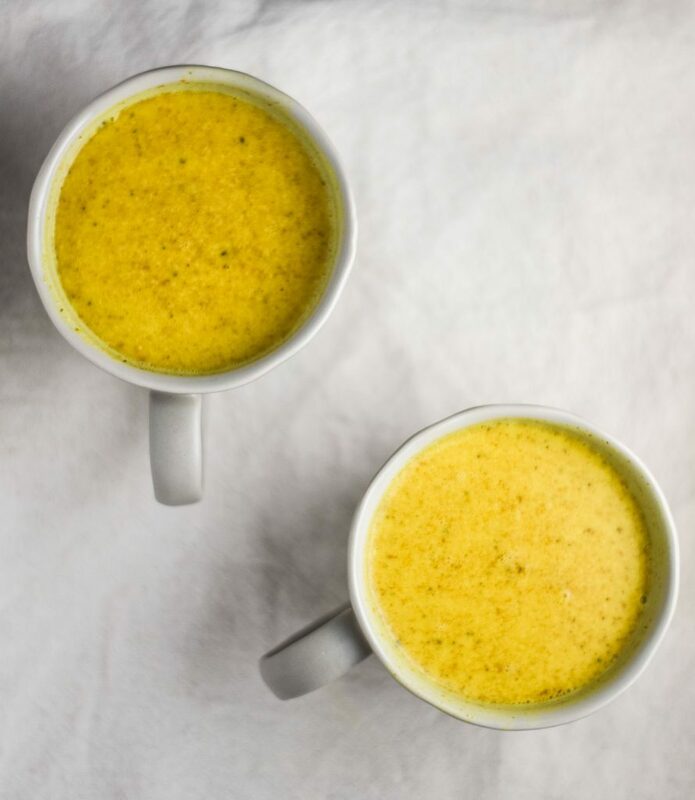 This vegan golden milk is the epitome of food that can heal. Curcumin, one of the active ingredients in turmeric, is linked to inflammation reduction, slowing tumor growth, and improving digestion. 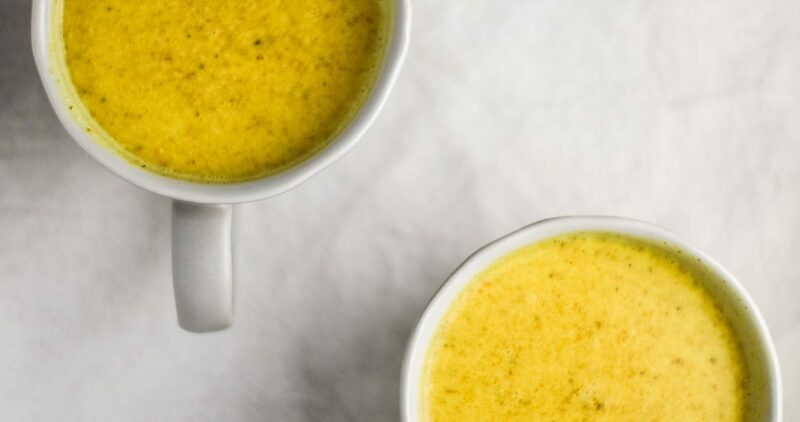 This golden milk recipe also contains ginger, cloves, black pepper, and coconut oil, which all bring their own unique health benefits and help improve the efficacy of the curcumin. Drinking a glass of golden milk feels like you’re giving your body a warm, perfectly timed, comforting hug. If you’re a regular reader, you know I’m all about wine pairings, but this one stands alone for good reason. Let the calm commence. Turmeric: anti-inflammatory, pain reduction, improved digestion, and anti-cancer effects (Source). Ginger: anti-nausea, anti-inflammatory, anti-cancer effects (Source). Cloves: high in antioxidants, antimicrobial, potential anti-cancer effects, improved liver health (Source). Black Pepper: improves absorption of curcumin (tumeric), improved digestion, antioxidant rich (Source). If you’re looking for a snack or meal with your golden milk, try some vegan salted chocolate chip cookies, vegan buckwheat pancakes, or vegan snickerdoodle cookies! 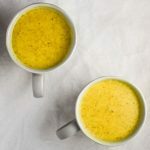 If you make this vegan golden milk, leave a comment, rate it, and and tag a photo with #plantandvine and your answer on Instagram. I can envision you curled up on the couch with a mug of golden milk, a warm blanket, and a book. Enjoy! Easy vegan golden milk recipe with turmeric, cinnamon, cloves, black pepper, ginger, and coconut milk. 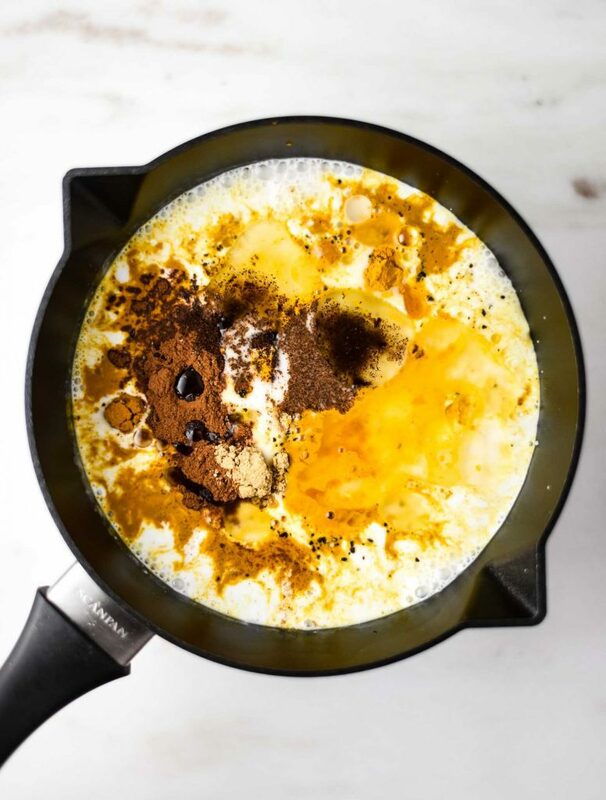 In a small saucepan, add coconut milk, almond milk, ground turmeric, ground ginger, ground cloves, ground cinnamon, coconut oil, black pepper, and maple syrup. Whisk frequently to combine over medium heat. You want to warm the golden milk, not boil it. The spices might clump initially but if you keep whisking frequently while heating, they’ll eventually disperse evenly. Once heated, taste to adjust flavor as desired. Serve immediately. Best when fresh but can be stored covered in refrigerator for 2-3 days. Reheat on stove or in microwave before serving. This recipe is so good! Comforting and I’m positive helped me kick the cold that I felt coming on. Thanks for sharing. I’ll definitely be adding this to my weekly recipes. Thanks, Lauren! So glad you enjoyed it. This comment made my day!